Like Apple, Google has proven so transformative in our digital lives that we’ve come to expect to be knocked flat every time the company releases a new product. But sometimes a Google product is merely adequate. Every at-bat can’t be a home run, after all. That’s the case with Field Trip, a free iPhone app Google launched earlier this year. The idea is that Field Trip will guide you to cool places to eat and fun things to do in unfamiliar cities, and it works fine. But it isn’t so much better than, say, Yelp’s iPhone app, that you need to rush out to download it immediately. 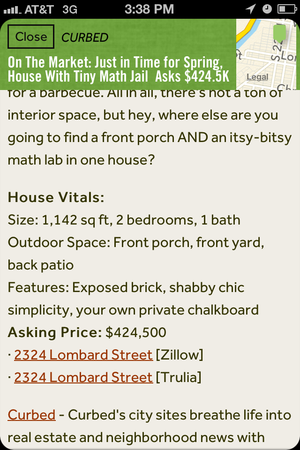 Field Trip tells you interesting tidbits about things around you, including real estate info. When you open the app for the first time, the first thing you’ll want to do is go to the “Select Your Interests” page. That name is sort of a misnomer—Field Trip assumes that you’re at least a little bit interested in all the available categories: Architecture, Historic Places, Lifestyle, Offers & Deals, Food & Drinks, Cool & Unique, and Art & Museums. You can’t choose (or un-choose) any one of them as an “interest.” Instead, you click on the topic itself, after which you’re allowed to choose which online services Google should use to generate recommendations for you. (Offers & Deals, for example, pulls its recommendations from just two services: Scoutmob and Vayable.) You can also pick if you want a source’s recommendations show up either more or less often. The best way to use the app is with headphones or a Bluetooth speaker connection, and probably while driving in a car. 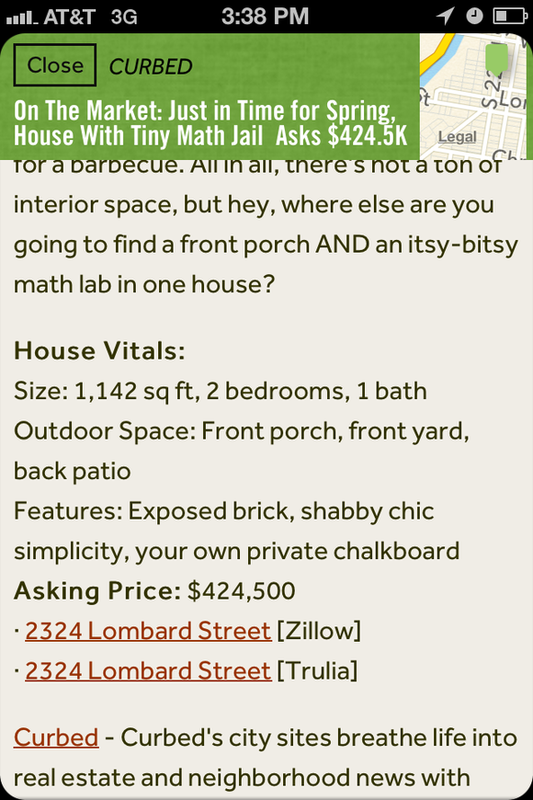 When you pass an item of interest, the app will push a notification to you. 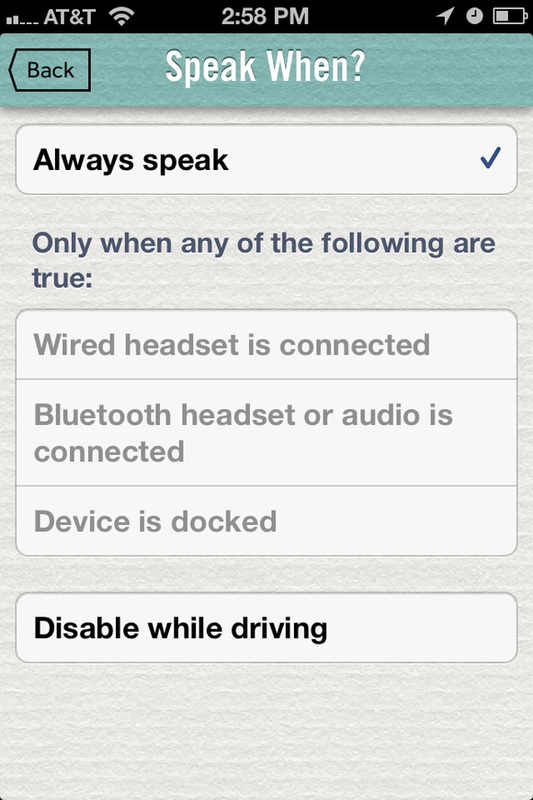 If you’ve plugged in your headphones or connected via Bluetooth, your iPhone will start to talk to you, in a semi-Siri voice, about what makes that spot special or enticing. The effect is like having a digital tour guide at your side. (Without the headphones or Bluetooth, Field Trip will wait until you open the app to start talking to you—at which point you can read the exact same words on the screen.) In any case, you can adjust how often and under what circumstances the app “speaks” to you. If you like a recommendation, you can “favorite” it, or share it to Google+ or another social network. Sounds pretty straightforward, right? So, what’s the problem? You can set when you'd like the app to speak. There are two. One is that the app is surprisingly buggy for a Google product. I only had one clear-cut crash in several days of using the app, and in other cases it simply stopped working. If you tend to run the app in the background as you go about your day, waiting for it to chime in with info on points of interest that you’re passing, it might be awhile before you notice that it has quit. The second is less of a problem and perhaps more of a misplaced expectation: Google has trained us to believe it’s anticipating our wants and needs almost before we know they exist. That can be a little scary at times, but users can also rely on it—look at Google Now, which anticipates the data you want based on the time of day and your location. Field Trip is comparatively dumb: It requires a lot of manual adjusting within the app to get the mix of recommendations you find most desirable. That’s partly because of its sources menu, and partly requires you to mark that a recommendation “is not interesting.” A simple, Pandora-esque thumbs-up or thumbs-down would be easier and more intuitive here, and help you feel like the app was learning your likes. Field Trip is a helpful app, but it’s not groundbreaking. Keep your expectations in check, and you’ll find it a useful guide to getting around a new town. This story, "Review: Google's Field Trip acts as your personal tour guide" was originally published by Macworld.